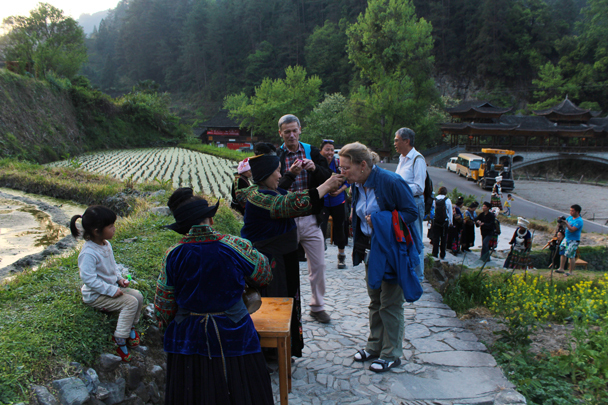 In Brief: A photo album from our visit to Guizhou Province in April 2015. 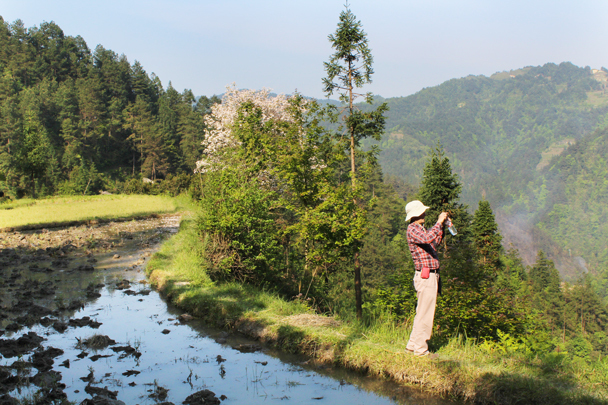 Early spring is the best time to visit Guizhou, a mountainous province in central south China. 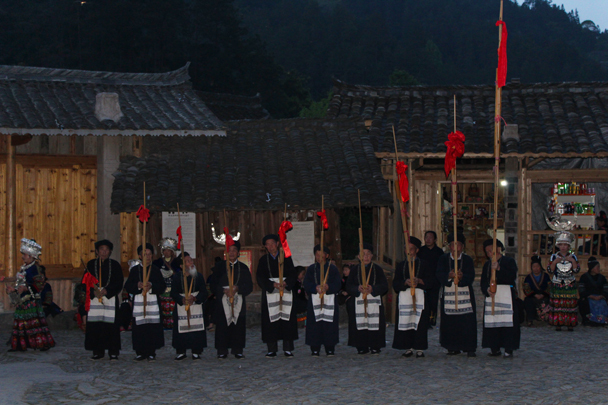 There are all together 18 ethnic groups living in Guizhou, with many based in the south-eastern part of the province. 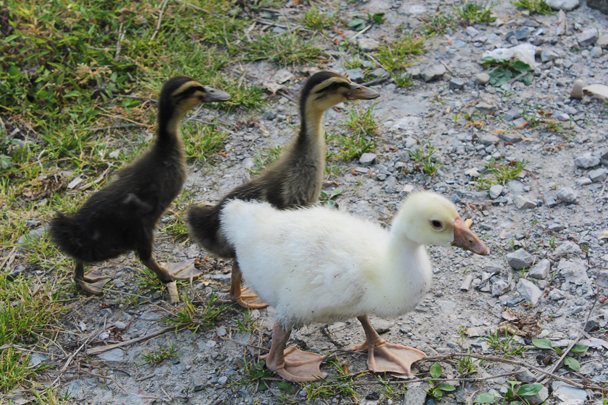 We headed down in April to take a look! 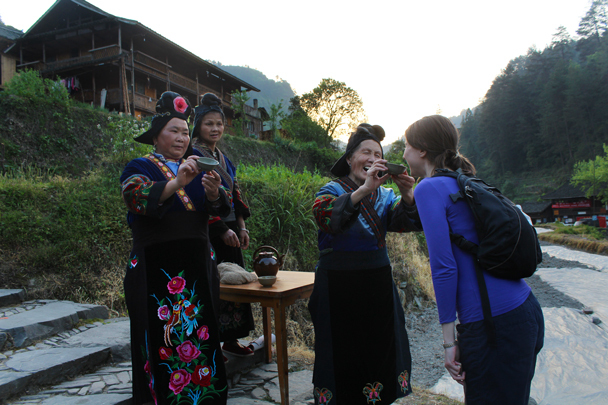 During the five days of the trip we saw a lot of the Miao and Dong culture – quite dissimilar, even though they’re based in the same area. 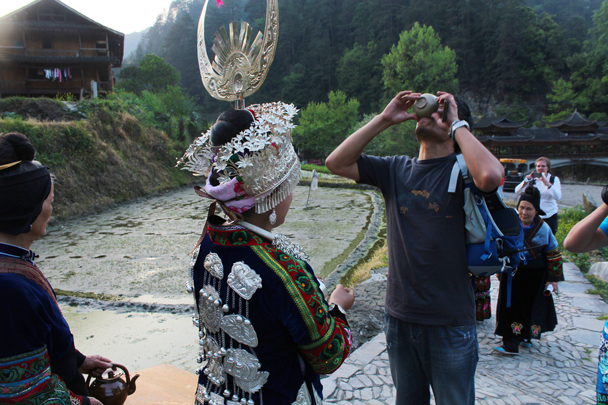 Seeing all the different styles of clothing, customs, and music was one of the highlights of this journey. 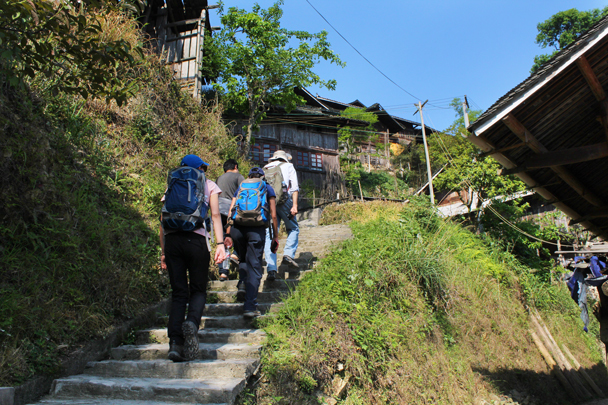 Another highlight was hiking between small villages in the mountains, especially passing through the terraced paddy fields where all the rice is grown. 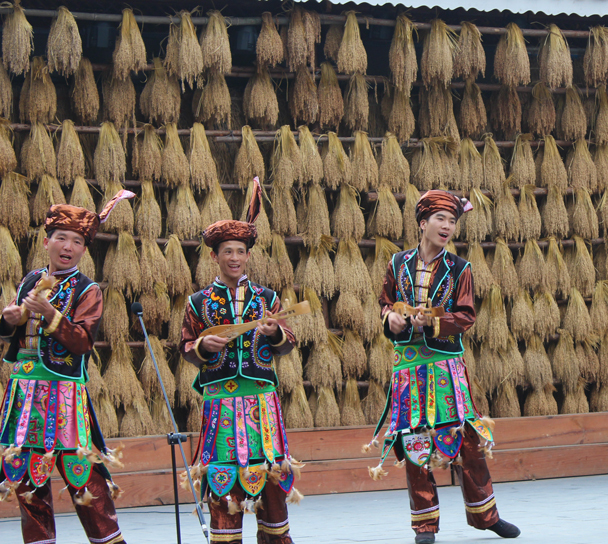 And we can’t forget the local food – delicious, and spicy! 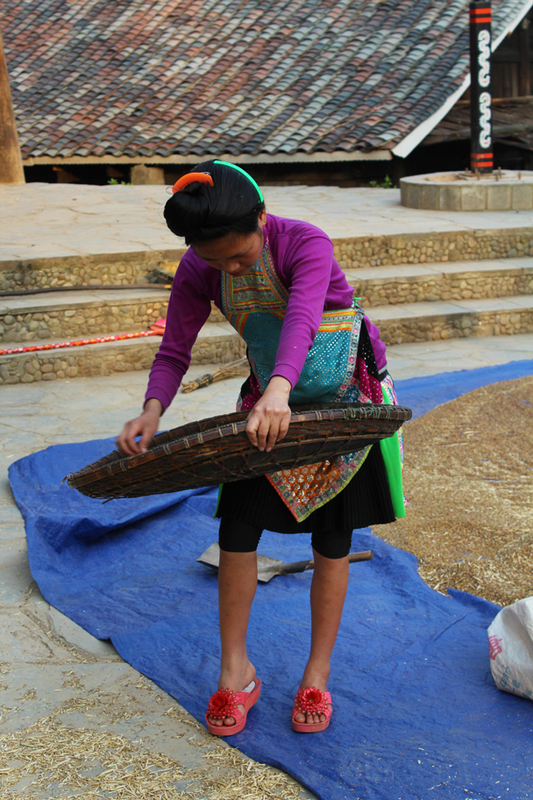 A local woman working in her rice field. 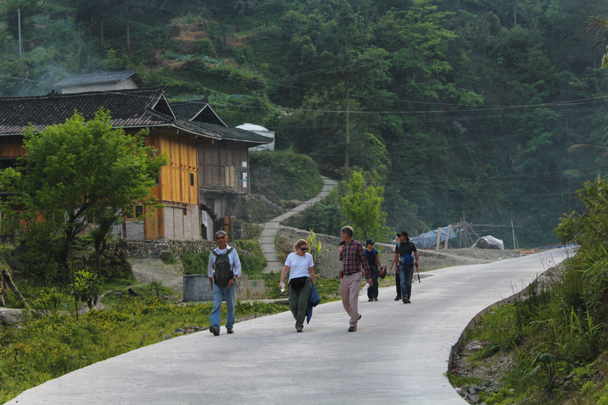 Starting a hike in a small village. 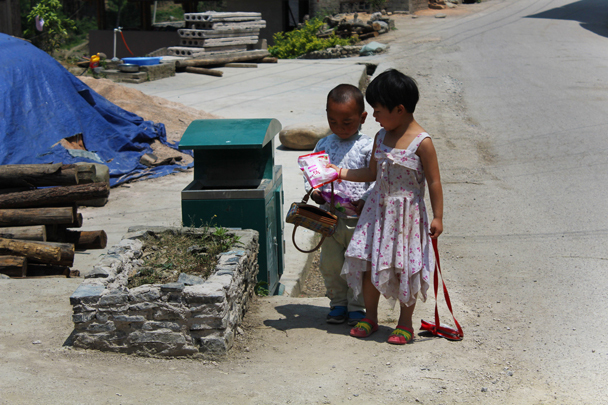 Nice view, stop for a photo! 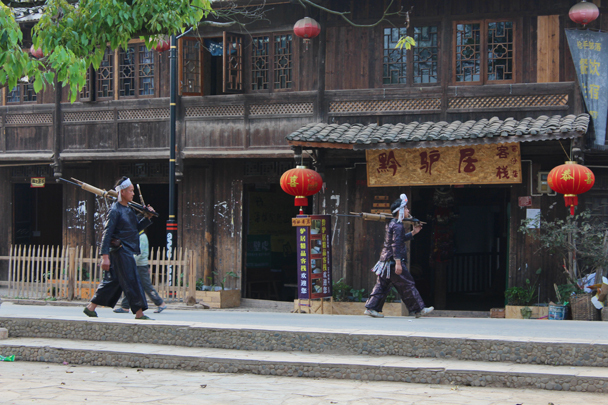 Heading for a local performance in a Miao village. 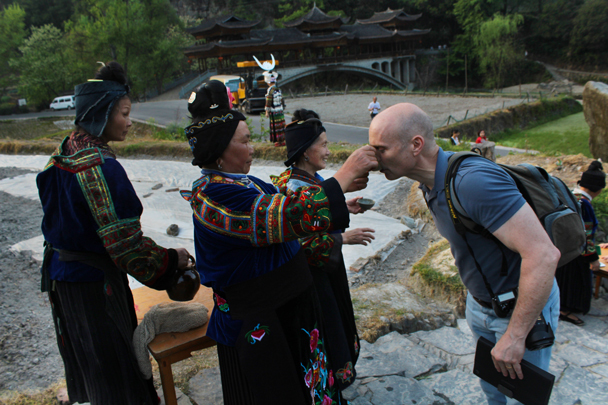 The customary welcome: 12 sips of rice liquor before you're allowed into the village. 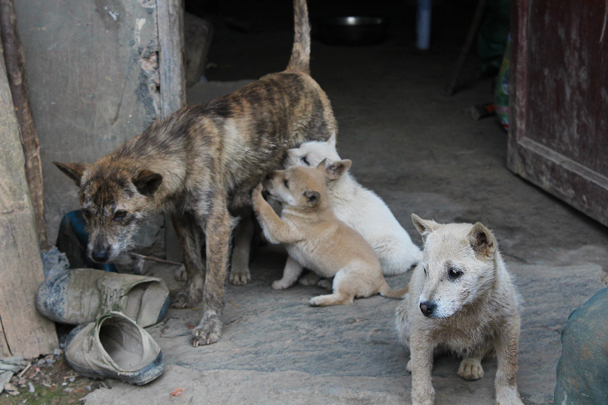 Everyone has to drink up. 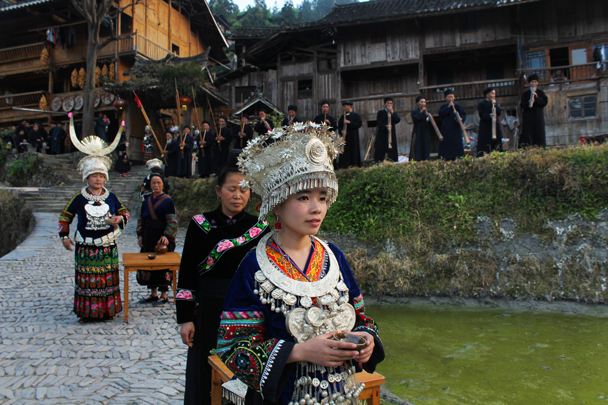 Young women dressed up to welcome us. 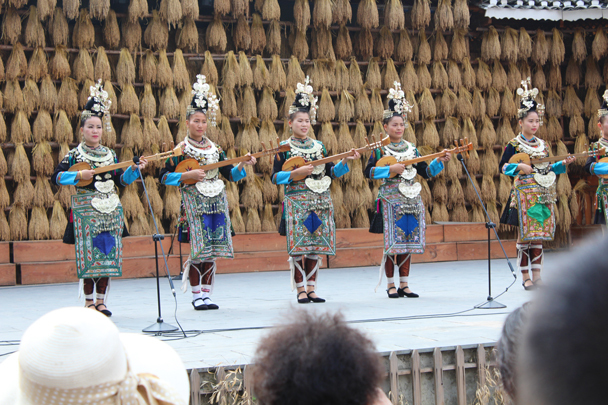 A performance of a traditional dance. 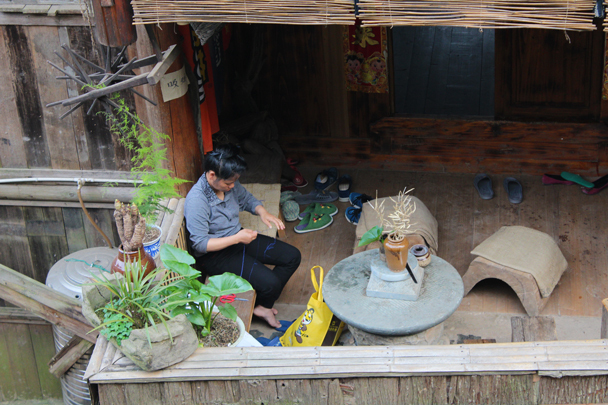 The ability to play the bamboo pipe is one of the most traditional skills for men in the Miao ethnic group. 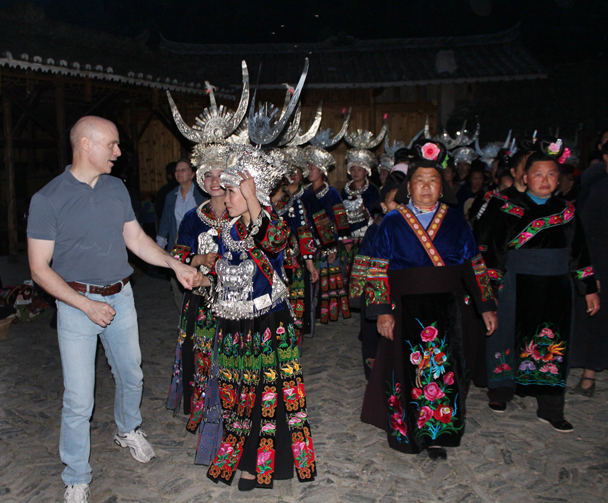 At the end of the performance we were joined in for a dance. 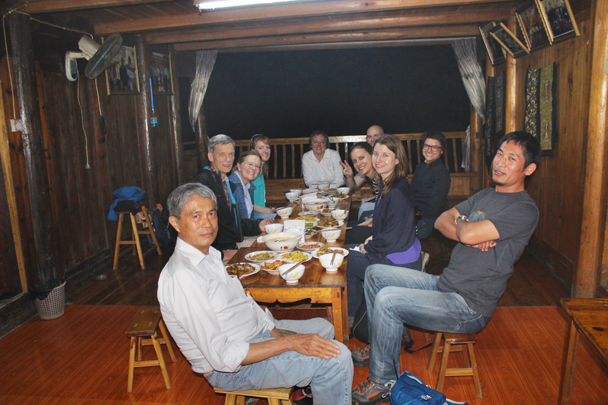 Dinner at a village of the ”Long Skirt” Miao village. 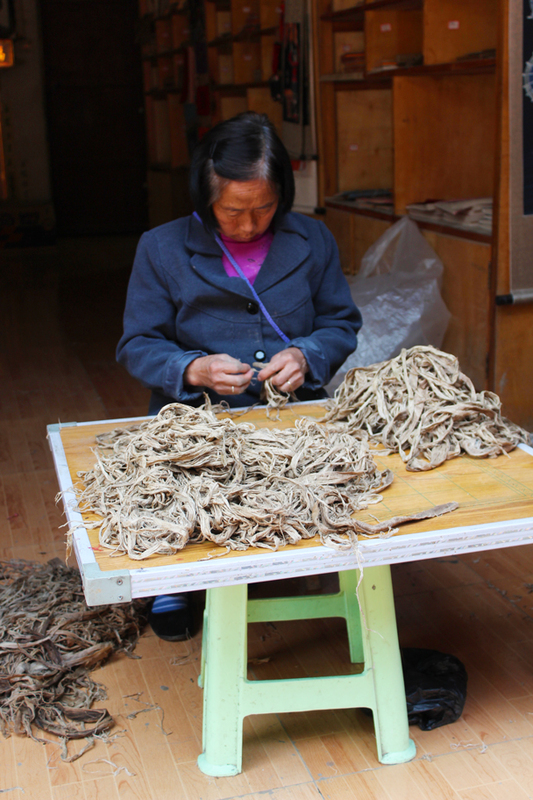 Part of the process of making paper—after boiling the leaves, they must be torn into tiny strips. 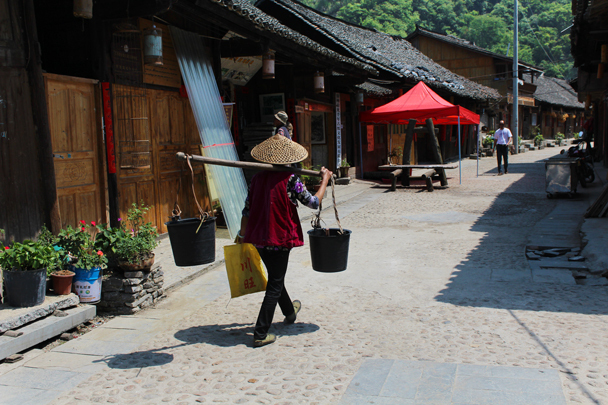 Carrying water back home, just as they’ve always done it. 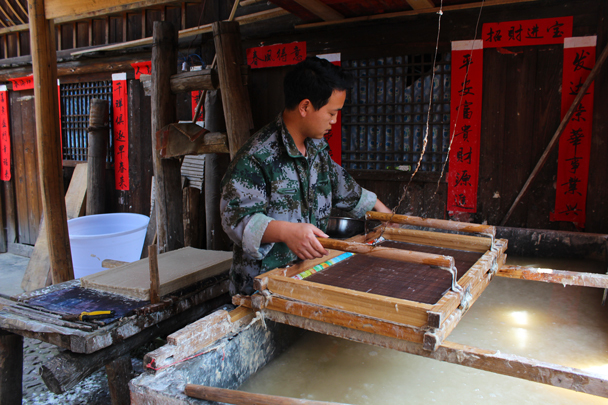 The next step of the paper-making process: pressing the water out of the pulp. 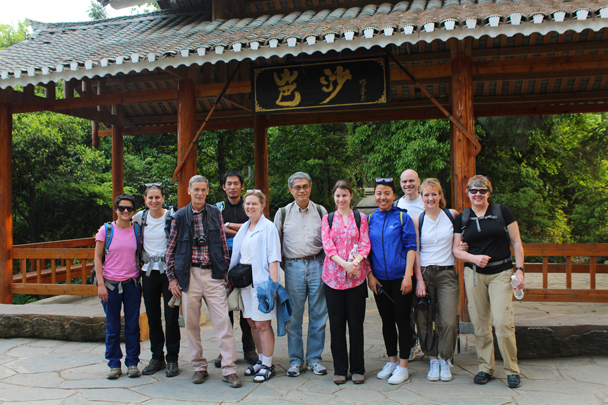 Group photo at Basha Village. 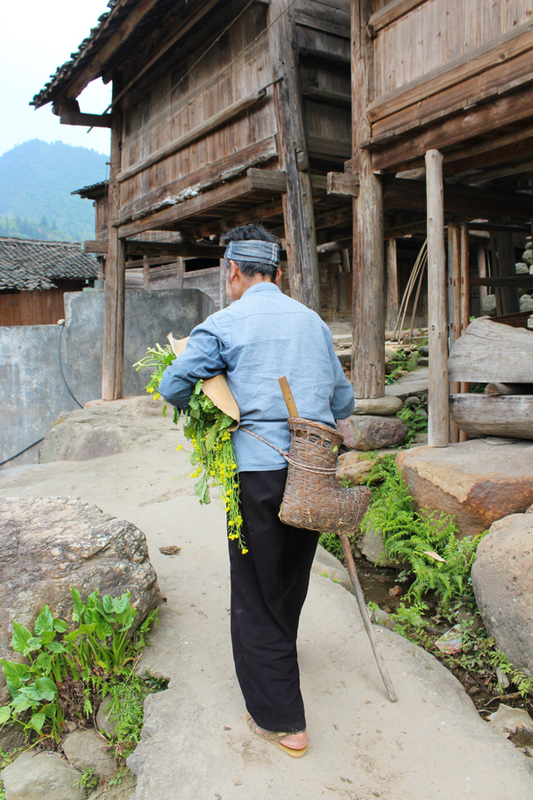 Collecting seeds for making oil. 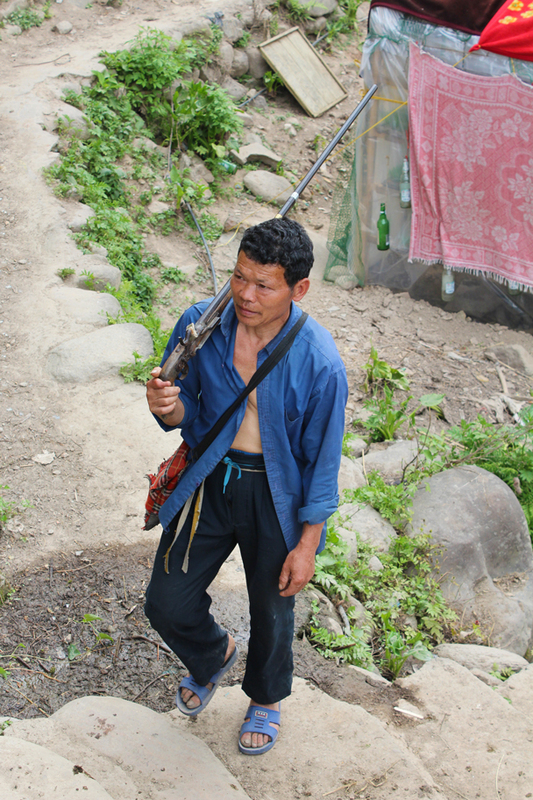 Carrying guns, on the way to a performance. 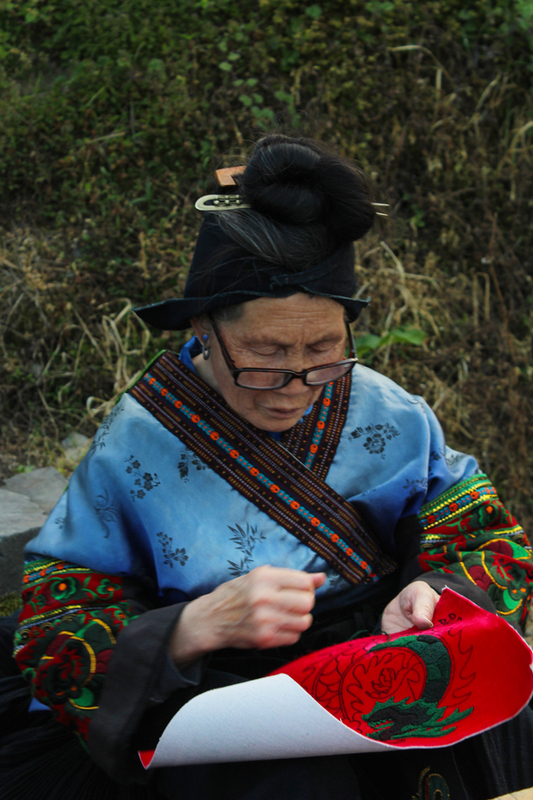 A quiet moment of knitting at the balcony. 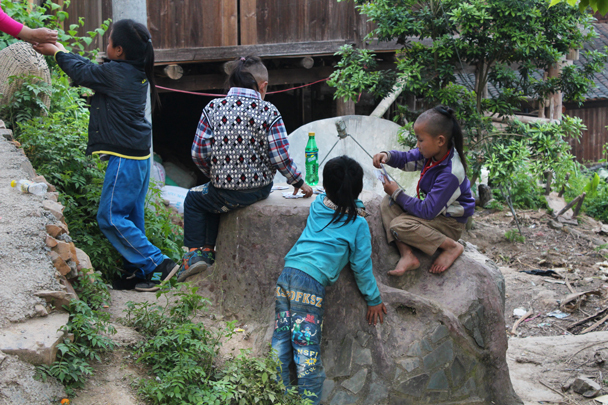 A very important tradition at Basha Village is a special sort of topknot for men, and it can't be cut. 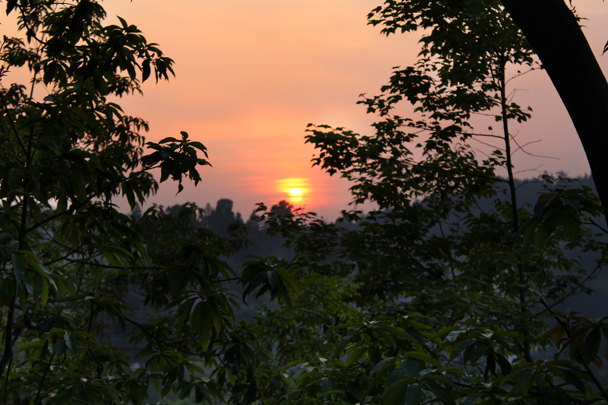 Sunset at the end of a beautiful day. Learning a new skill. 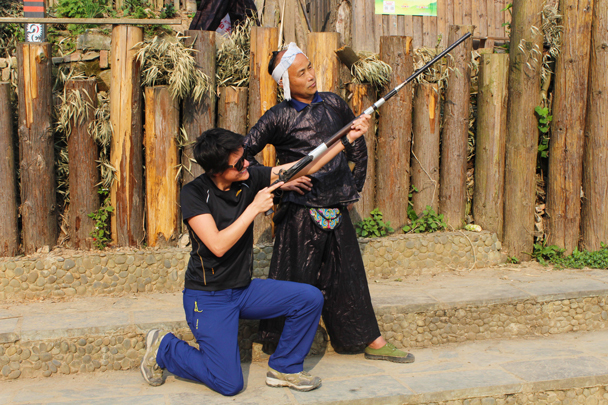 Hunting is part of the cultural tradition, and this area is one of the few places in China where people are allowed to own a gun. 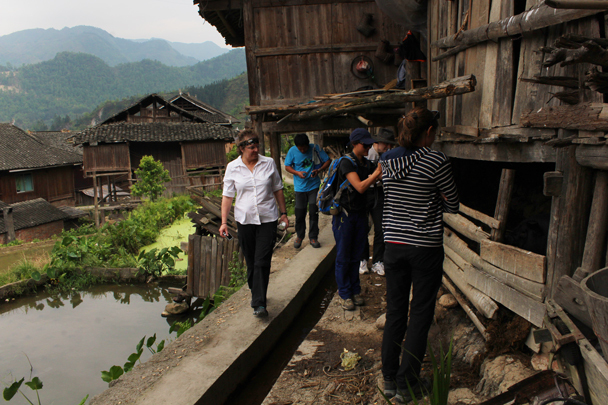 Looking about a village of the Zhuang ethnic group. 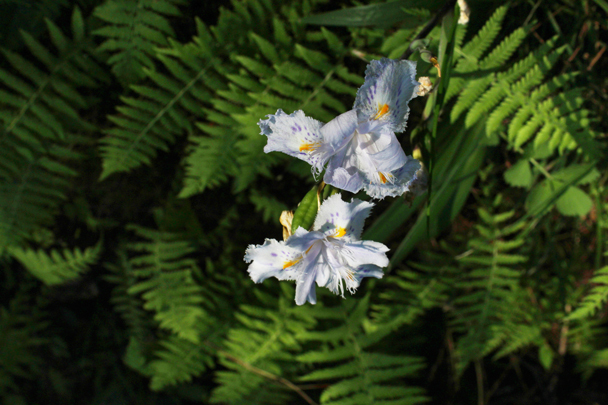 Taking some wild greens home. 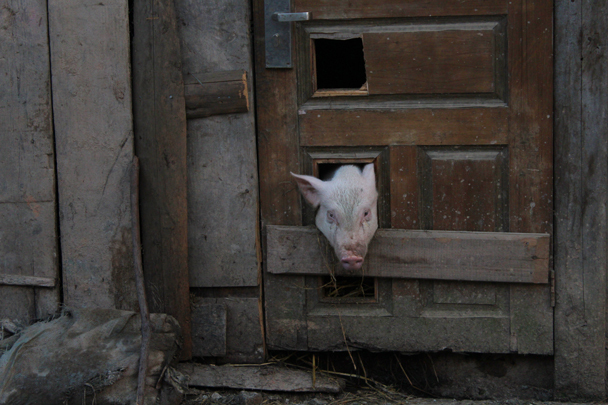 A hunter on his way home. 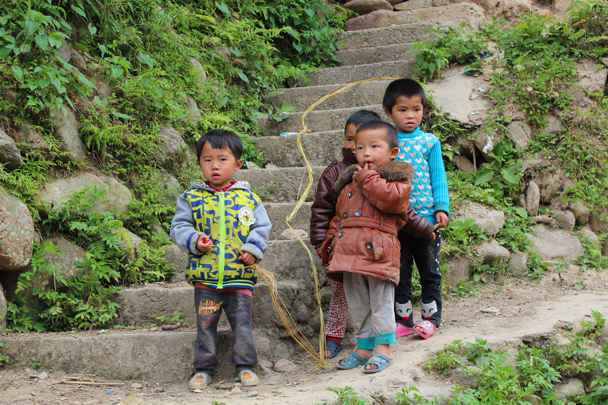 Local kids’ toy: dry grass wound into a rope. 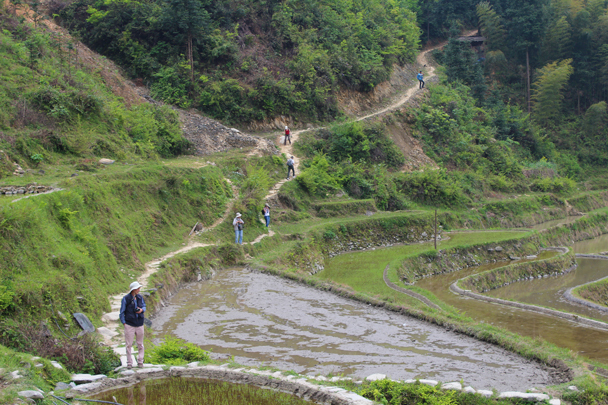 Walking through the rice terraces might require some balancing skills. 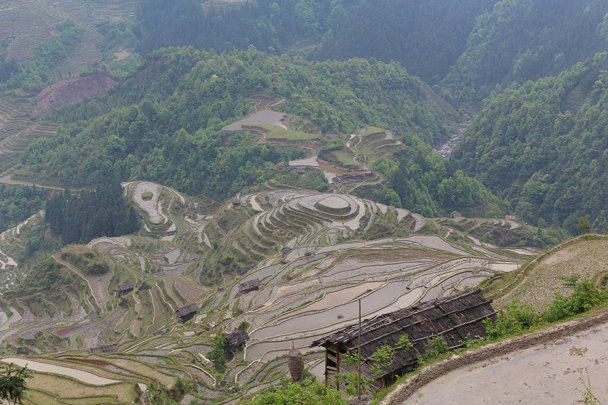 Bird’s-eye view of the rice terraces, carved into a steep hillside. 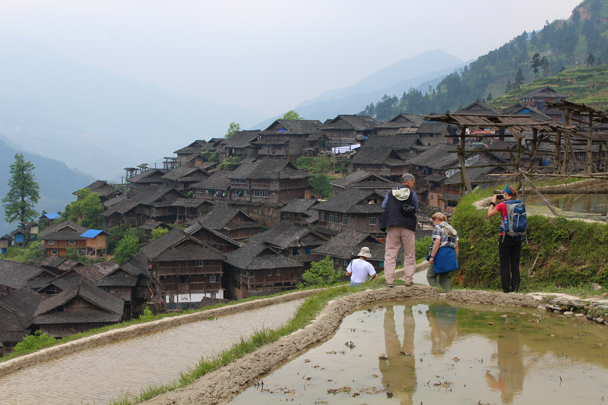 The village is also built into the hillside. 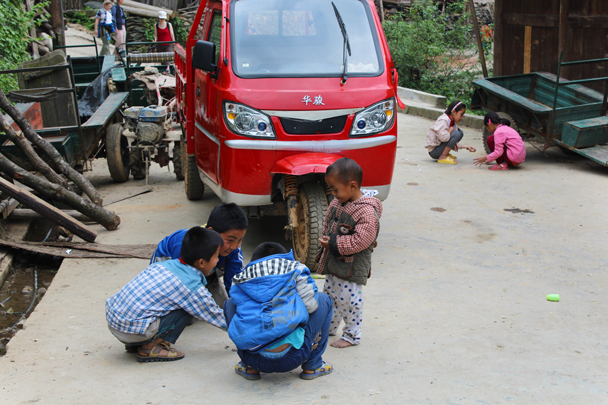 Children playing in the village. 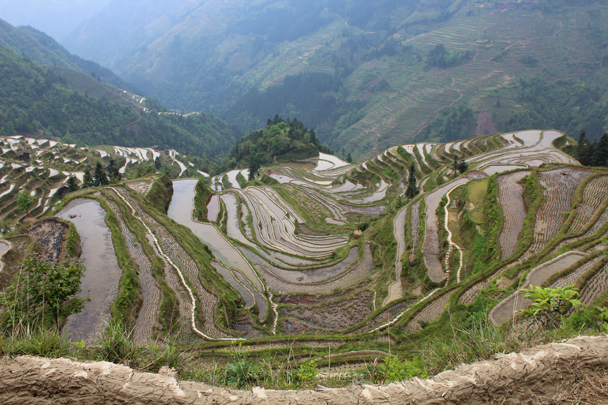 The rice terraces look incredible. 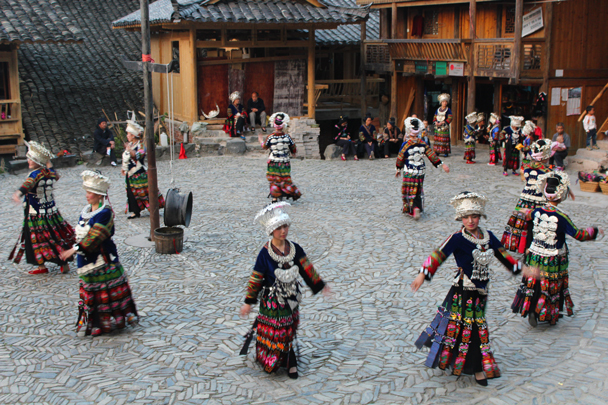 We saw a performance of traditional music at Zhaoxing Village. 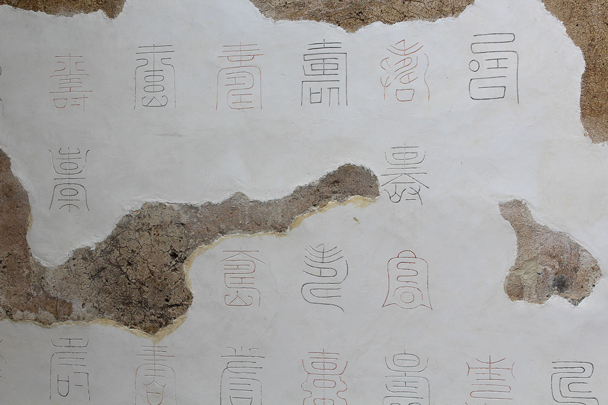 “Longevity” written in ancient-style Chinese characters at a scholar’s house in Qingyan Town. 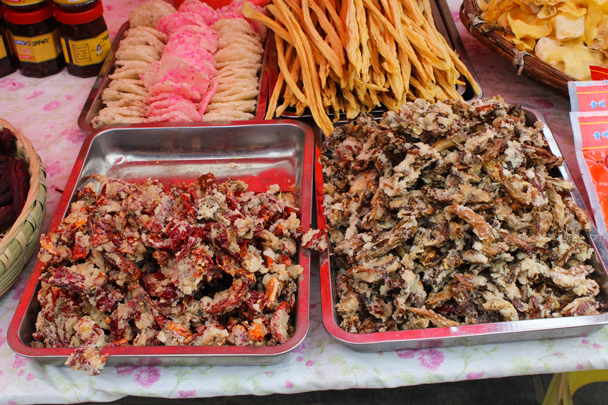 Street food: different types of dried sweet potato. 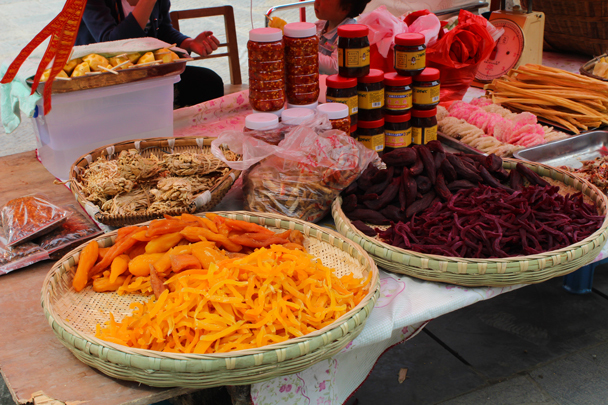 Fried chilli peppers and fried rice cakes, popular local snacks. 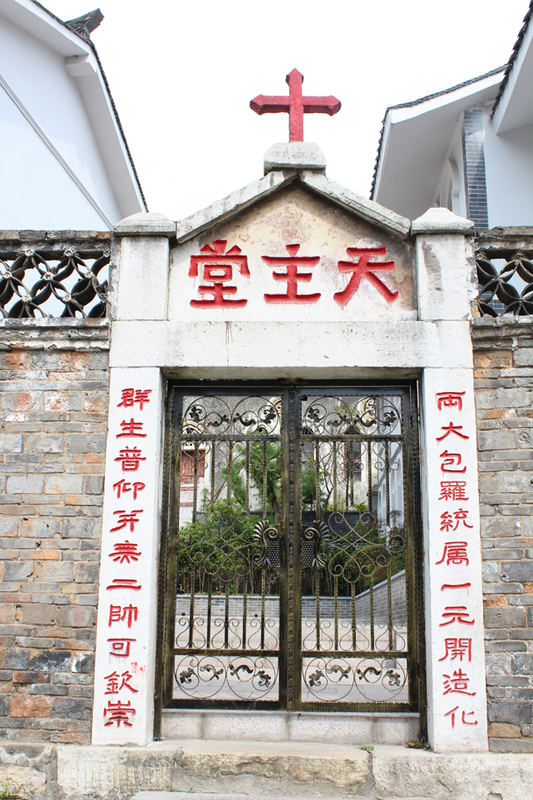 This gate was all that was left from the original construction of a 30s-40s Catholic church that was destroyed during the Cultural Revolution. 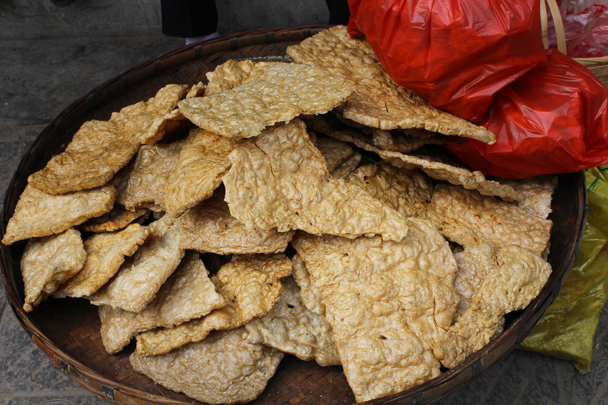 Deep-fried tofu ready to eat. 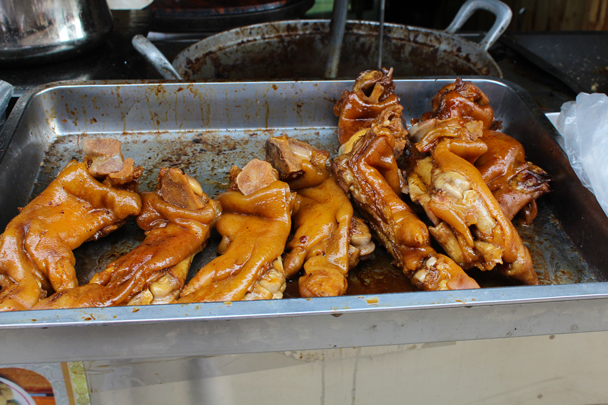 Pig's trotters, also ready to eat. 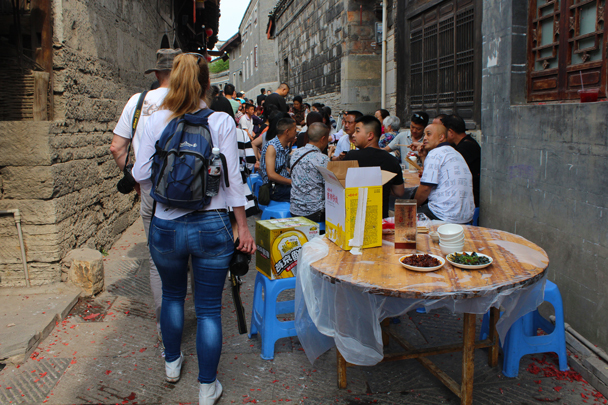 We stumbled upon a wedding banquet. 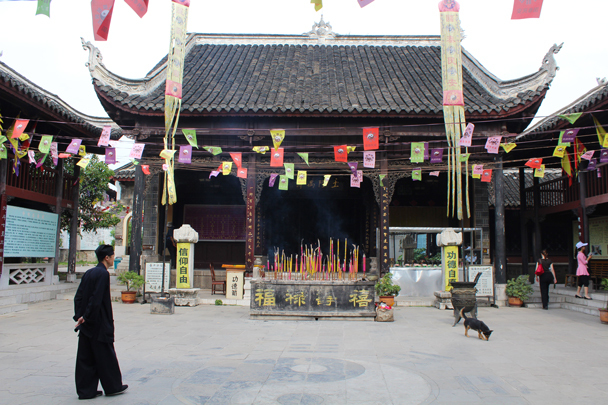 Wanshou Palace, a Taoism temple that dates back to 1798. 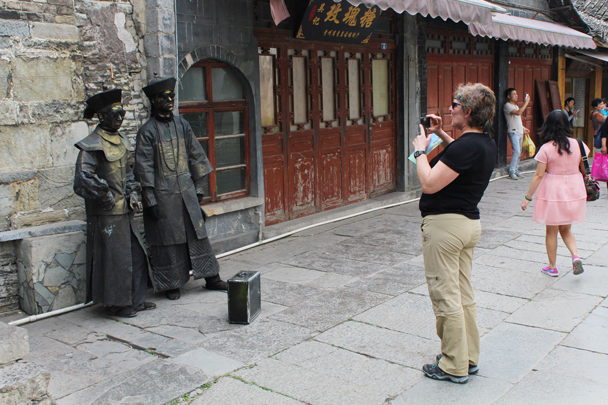 In Brief: We made it all the way up to the 24-Eyes Tower at Gubeikou on this hike—take a look at 17 photos a day out on the Great Wall.